Anybody who visits the Siachen glacier has to land at Kumar Base—perhaps the only base named after a living army officer. But the stocky and muscular Col. Narendra “Bull" Kumar, still fitting the epithet at 77, is embarrassed when this is mentioned to him. This, despite the fact that he almost single-handedly ensured India’s presence at Siachen, the world’s longest non-polar glacier. In 1978, Kumar, as commandant of the Indian Army’s High Altitude Warfare School, joined two German explorers in an attempt to navigate the upper reaches of the Indus river in Ladakh. Two years later, one of his former co-travellers returned to India and asked Kumar to join him in an expedition to the Nubra Valley, which separates Ladakh from the Karakoram ranges. “The only problem," he pointed out on a map, “is that it’s in Pakistan." It was the first Indian expedition into the remote glacier. The team started at the snout of the glacier and reached halfway up the massive bulk of uncharted ice, braving temperatures that dipped to -50 degrees Celsius, and navigating tricky crevasses, peaks and passes—bound to each other with thick ropes. “Every day Pakistani fighter jets would circle above us," says Kumar, “and we were carrying no weapons!" The team returned with the trash left behind by Pakistani expeditions as proof of their incursions. In 1981, Kumar went back to Siachen, this time covering it from snout to source, and summiting Sia Kangri (24,350ft), India’s northernmost point. Three years later, in the summer of 1984, the Indian Army launched its first major offensive against the Pakistani army at Siachen and established bases along the glacier. Their main weapon? The detailed maps, plans, photographs and videos made by Kumar and his team. On 25 June, Kumar was honoured with the McGregor Medal, awarded by the United Service Institution of India for the best military reconnaissance, exploration or survey in remote areas in the country. Although he is one of the most highly decorated officers in India, this recognition was still a significant thrill for Kumar. “But for my reconnaissance work, all of Siachen and its adjoining regions, including the Nubra Valley, would be Pakistan’s. That’s an area covering almost 10,000 sq. km. That’s how much this award means to me," he says. Previous recipients of the award include such historical figures as the 19th century British explorers Francis Younghusband and Frederick Bailey. “People used to tell me I’m in the league of early 20th century explorers like Eric Shipton," says Kumar. “Now they’ll tell me I’m in the league of 19th century explorers like Younghusband—just goes to show how ancient I’m becoming!" Unlike Shipton and Younghusband, though, Kumar’s pioneering exploration work is largely unknown outside India’s mountaineering and Armed Forces circles. He was the first Indian to reach up to 28,700ft, in his first attempt at climbing the Everest in 1960, before having to turn back due to inclement weather. 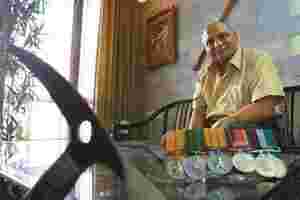 In 1965, he was deputy leader of a team that put nine Indian Army climbers at the top of the world’s tallest peak. Capt. M.S. Kohli, who led the 1965 Everest expedition, says Kumar’s climbing career was “astonishing". “He succeeded in almost every expedition he undertook," says Kohli. “Despite his frostbite injuries he was an extraordinary climber and explorer. Nothing stopped him, he really was just like a bull." Wing Commander T. Sridharan, now the treasurer of the New Delhi-based Indian Mountaineering Foundation calls Kumar “India’s Chris Bonnington"—“Kumar is a great leader as well as a great mountaineer," says Sridharan. “Most people would rest on their laurels if they achieved even a quarter of the things Kumar has done, but he just went on and on. His eye and mind for exploration is unparalleled." Sridharan points out that no one had successfully climbed the north-east spur of Kanchenjunga before Kumar fought his way to the top in 1977. “Before him people have been trying and failing for 45 years," says Sridharan. “It’s probably the most technically difficult climb in India." In 1961, Kumar led a harrowing expedition to climb Neelkanth (21,644ft) in the Garhwal Himalayas. “We succeeded, where everyone else, including Edmund Hillary, had failed," he says. But that success came at a price. While decending from the summit, the five-member team was stuck for seven days inside a narrow crevasse at 19,000ft, trying to escape a raging storm. “We had just one tent which we lay on the floor of the crevasse, and then the five of us just huddled together for seven days," recalls Kumar. All five members suffered severe frostbite; Kumar lost four of his toes. In the biggest irony of his life, Kumar was put in “permanent category C" by the Indian Army, which meant no postings above 7,000ft. “Every time I was in the mountains, I had to give the government a certificate saying that I absolve them of all responsibilities should anything happen to me," he says, breaking into a laugh.